ItsJustANnumber.com believes that love has no age and offers opportunities for intergenerational dating. The website ranks #5 among the age gap dating sites reviewed. May-December relationships are becoming popular in the modern world and ItsJustANnumber.com helps to take these romances to the next level. The dating site boasts itself with a humongous member base that are carefully screened to promote only age gap dating. 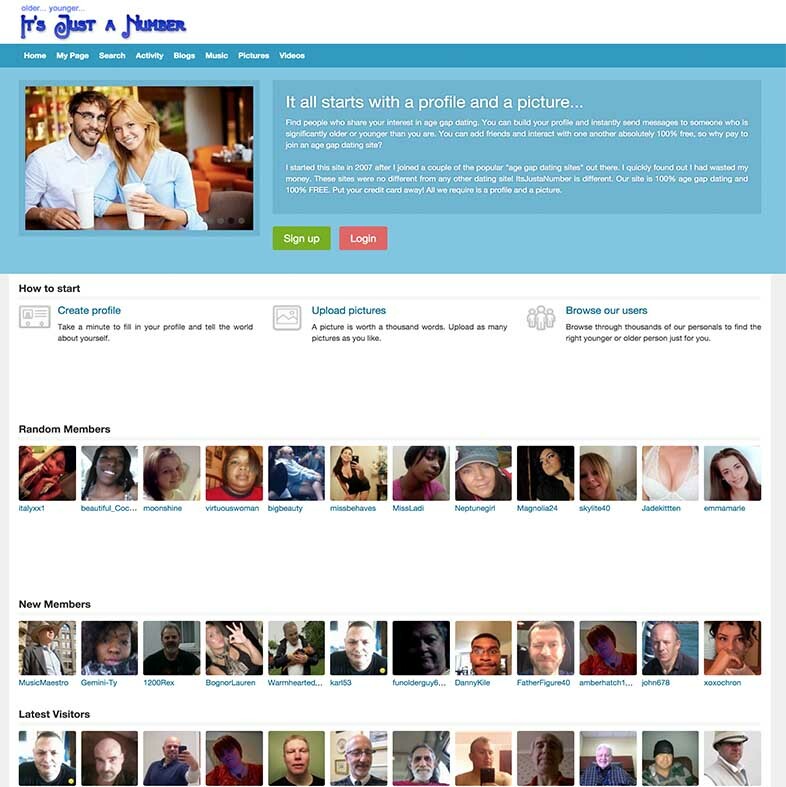 In the midst of full or partial premium online dating sites, ItsJustANnumber.com is a completely free website that allows older people to date younger ones and vice versa. It’s 100% free and easy to sign up. It involves a simple three-step registration process; create profile, upload photos and browse users. Use an email address to sign up, choose a username and the website makes sure that you are not a robot by asking you to fill a captcha. After this process, fill in your personal information such as gender, location, interests, hobbies, likes, education, occupation and a write few words to describe yourself to create a profile. The site is pretty strict with photos. It accepts photos only with faces and does not allow you to proceed further without a valid photo. The last step guides you to browse pre-existing users’ profile. The website displays the newest members, random members and the latest visitors on the homepage. There is a public timeline that displays all the recent happenings on the website. It shows members who have recently signed up, became friends, who posted what on the wall and other activities. Given that it’s free, the website does not make any compromises with its features or services. It allows users to search for older or younger partners, interact with potential matches and establish a romantic relationship. ItsJustANnumber.com enables its users to contribute via blogs, share music, pictures and videos with other members. Members can chat with their interests through the instant messenger and there is a dedicated news section offering latest updates on the website. The site caters to the needs of its users by providing useful features to find potential matches. Members can browse through thousands of users’ profile, search by location/username, send messages, add friends and communicate through chat messenger. Privacy features are top notch on ItsJustANnumber.com. The site does not allow its members to share personal contact information and explicit comments or photos. Older people looking to date or find their dream partner but hesitant to swipe their credit card often can join the best free age gap dating website, ItsJustANnumber.com. The website encourages people to make meaningful age gap connections with its huge searchable database. Instant messaging is available all hours of the day to connect with potential matches. All in all, ItsJustANnumber.com brings in a friendly approach to age gap romance.